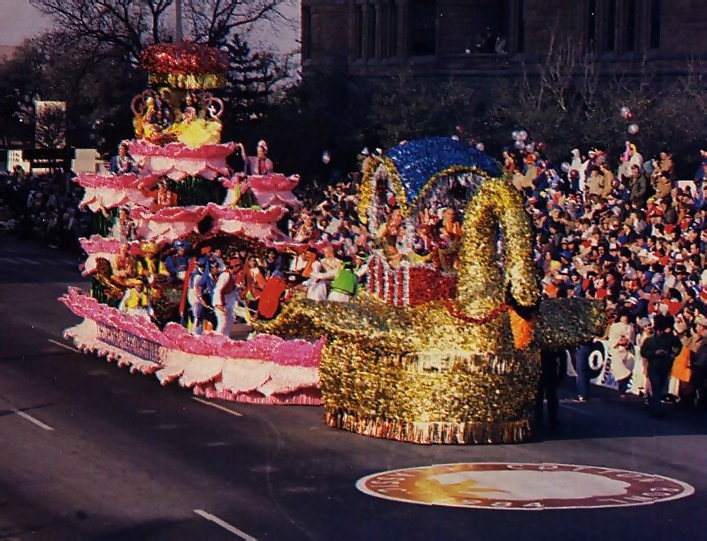 Drawn by a shimmering golden swan, Dallas ISKCON’s lotus float glides past spectators at the twenty-seventh annual Cotton Bowl Parade. Designed and built by members of Dallas ISKCON, the float featured a gigantic golden swan pulling a 45-foot-high lotus flower. Atop the swan, surrounded by several Hare Krsna children, rode a murti (statue) of His Divine Grace A.C. Bhaktivedanta Swami Prabhupada, the founder and spiritual master of ISKCON. Persons portraying Sri Sri Radha-Krsna and six of Their personal attendants rode on the lotus flower. Completing the display were ISKCON devotees, along with Indian musicians and dancers. The float reflected the theme of this year’s parade, “That’s Entertainment,” and demonstrated that art, music, dance, and all human talents should glorify the Supreme Lord’s eternal spiritual pastimes. The International Society for Krishna Consciousness has participated in other parades as well. Hare Krsna floats won awards in Hawaii at the 1981 Aloha Week Floral Parade and in Australia at the 1983 Moomba Parade. 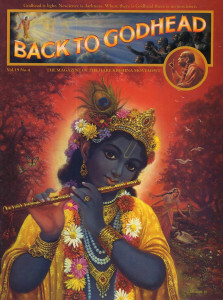 “Now that most of the writings of A.C. Bhaktivedanta Swami Prabhupada exist in German translation, German-speaking people have direct access to the profound philosophy and theology of the Bhagavad-gita and that of-the great Indian saint Sri Caitanya Mahaprabhu, in their original setting within a living Indian tradition. “I have found that by studying the works of Sri Bhaktivedanta Swami, my insight into the Christian tradition, to which I belong, has expanded considerably. I have no doubt that, ultimately. God is the fundamental common basis of Krsna consciousness and Christianity. . . . Now, I believe, is the time to explore the common spiritual foundations of these two traditions and learn from each other about our common Father. Los Angeles—The distribution of Srila Prabhupada’s books is booming, according to a recent newsletter from the Bhaktivedanta Book Trust (BBT), the publishing arm of ISKCON. In 1983, the BBT’s India division tripled its book distribution volume over the previous year’s, while Ireland, Israel, New York, Texas, Switzerland, and Trinidad doubled theirs. Los Angeles and Northern Europe increased by about forty percent. BACK TO GODHEAD magazine doubled its circulation during 1983. Some observers have doubted whether the Hare Krsna movement could maintain its momentum after its founder and spiritual master, His Divine Grace A.C. Bhaktivedanta Swami Prabhupada, passed away in 1977. But as a testament to the continuing vitality of ISKCON and to ISKCON’s dedication to Srila Prabhupada’s instructions, global book distribution has doubled since 1977.